Playing the game, I always felt that the contour map didn't really line up with the terrain. If you clicked on the high point of the contour map, it was a 50/50 chance you'd end up on a hill. I always suspected I might have done something wrong importing the World Machine terrain so I decided I would generate my own contour map from the imported terrain heightmap to see what I had done. Ostensibly I've been working on getting a trailer ready for Miranda's early access launch. What I have actually been doing is avoiding recording anything, playing with the game, polishing features and working through a surprising amount of the feedback and bugs that showed up in last month's test weekends. Probably the best thing about making the trailer is that more and more of the game is making me think that is so cool! This might actually work!!! Working on a game, focusing so much on what is broken all the time, you can go a really long time without that feeling. I was surprised to discover what an exhausting job it is to select music to go with the trailer. I can't remember when I felt so tired as I did after spending an entire day listening to mostly-awful stock music. It's just so depressing. Out of several hundred tracks and several complete symphonies I listened to, I found three tracks I liked but they were still more or less unsuitable for what I have in mind. I briefly toyed with the idea of making my own music using loops because hey, I did all this other stuff myself! But I know nothing about music composition and that seems like a rabbit-hole. So I'm going to hire a composer to do the music for me. It seems to be the only way to get music that I'll be satisfied with. It also makes another clever, but previously unimaginable feature possible, so that is doubly intriguing. One of the more common items of feedback that I received from the test weekends was that people would select a location for their base, then have problems laying out their base buildings because the terrain was too rough. Previously Miranda had a contour map to help players select a location for their base. 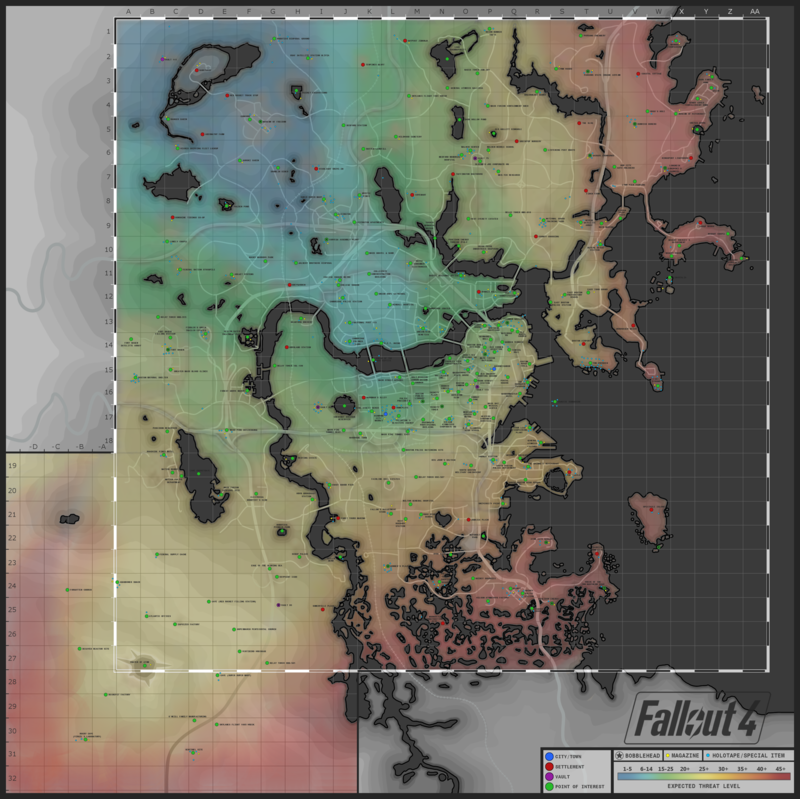 I was doing some work on the contour map when I remembered this Fallout 4 map and realized that a heatmap where good areas are blue, and bad areas are red might be more intuitive for new players. So I'm writing this up so if it happens again I won't have to spend another seven hours figuring it out all over again. Problem: Windows 10 client machine could not see the server PC for file or printer sharing. net use \servername gave error 53 "Network path not found". The server PC could see the client PC fine. The client could PING or use NET USE with an IP address no problem. But I couldn't print or map drives using the machine's network name. It has been a busy week of tweaks. I'm working on the trailer, so I'm having to fix a bunch of little things to get Miranda looking her best for recording. The ATV is the star of the first shot of the trailer, and it needed a bit of work. Previously it had exhaust, but I was never really happy with the look of it. I added wheel dust which looks pretty great, but that made the exhaust look even worse, so in the end I removed it. This year Full Indie demo nights and the weekend playtests gave me a chance to see people play the game I have worked so hard to build. It was awesome. It was also the year all the technology to run a massively multiplayer seamless open world real time strategy game finally came together. Miranda can now run on multiple servers just like it does on one. With this last piece of uncertainty gone, Miranda is finally ready for a larger audience. So after the second Test Weekend, player numbers were up, per-player playtime was significantly up, and bug reports were down - so I'm pretty pleased about all of those trends. I've been busily at work fixing bugs. There were 115 crash dumps submitted the second test weekend, 80 of those are now fixed. With a lot of easy bugs fixed after the first weekend, there were some real headscratchers submitted this time around. I also went through all 234 of my existing bugs and categorized them into A (Hang/crash/missing feature) B (Major defect, no workaround) C (Minor defect, cosmetic, has a workaround) and D (probably never going to get fixed) so I can start working on them. That's actually really nice for me because I can just ignore all those C's and D's for now. If you are playing The Imperial Realm::Miranda this weekend, please fill out this short anonymous survey when you're done. It should only take a couple of minutes and your feedback really helps. After you start the client once patching is complete, at the bottom of the login screen it should say Version 0.0.7.55. If there are any problems or news about the test, I'll be posting that here. If you experience a crash, please let the Lair Crash Reporter submit the crash report. Like last time, Miranda is what is affectionately known as a Crash Build so if even the slightest thing goes wrong, the game crashes and sends a report. Crashes are to be expected, sorry if they mess up what you were doing. There is also an in-game bug reporting tool, just hit Ctrl-B at any time or choose Feedback from the main menu. If you prefer, you can email me (that's my email at the top of this post) or add a commment below. I'll be doing my best to keep an eye on things this weekend. Clicking on the map, showing a group(11) and home (H) have fewer loading screens. The Chat window focus issues are fixed. Players can now press Enter to chat. The Main Menu now has a feedback button. 3 other additions, 11 changes, 25 bug fixes. Even with players submitting 130 crash reports on the first test weekend the feedback on Miranda was overwhelmingly positive. What was most gratifying to me was to see the amount of playtime everyone put in. A lot of people spent a large part of their weekend playing with this game I built. I got a lot of great feedback and I wanted to address some of it here. A couple of players had problems laying out their bases. With Miranda's realistic terrain, there are ridges and peaks and cliffs and buildings can't be put just anywhere. It can be particularly tricky for large buildings like the refinery. One of the attributes of buildings that can be increased is the foundation height so buildings with higher foundations can be placed on steeper slopes. Miranda's base layout map shows how steep the terrain is so players can choose flatter areas for their base. Communicating all of this to the beginning player is an issue I'm still trying to figure out. Some players mentioned that they didn't like the loading screens when moving the camera drone around the map. Luckily that was something I just hadn't gotten around to yet and players this weekend should see faster camera drone movement and fewer loading screens. One player was concerned that players will just move their base if they see someone coming to attack them. It is not immediately apparent, but that actually isn't a good idea. What happens when you log off from Miranda is that your units stay on the map for 30 seconds. But during that time nobody is controlling them, they won't fight back, they just sit there. So if someone is about to attack you, it is a very bad time to log off. To make that clearer to players, I'll be adding a warning if the player chooses to log off when enemies are nearby. One of the big UI problems during the test weekend was with the chat window getting confused with when it did and didn't have the keyboard input focus. I've fixed that up and added a hotkey (Enter) that puts the player into the chat window instantly. Some players mentioned they didn't like having to go to vendors to purchase parts instead of just building units with war factories. Vendors aren't going away, but the feedback gave me a really good idea for another feature that I think those people might like. The magic wand also brought forth some really great suggestions so keep them coming. A lot of things that people asked for are already planned, things like walls and Starcraft style controls and engineers. One feature that sadly won't be coming to Miranda is Supreme Commander style Strategic zoom. Most RTS games (like Supreme Commander) use a system called deterministic multiplayer. The way that works is that everyone starts at the same time with the same conditions and rules, and the multiplayer just passes each player's keyboard and mouse input to all the other players in the game. This is extremely efficient with network bandwidth but it doesn't scale beyond a small number of players and it doesn't support players joining and leaving the game. Miranda uses a different system which is also very efficient and allows players to join and leave the game at any time, but the size of the area which is replicated with high fidelity is limited. If you zoom out, there's actually nothing to see. So no strategic zoom on Miranda. I did modify the camera to zoom out a little further, I'm not sure yet if I like it. The first indication there was a problem was a new name popping up on the list of players. I had set up a line of ATV pickets around my base but I never saw what happened to my picket unit. Its brave sacrifice was noted only by a tiny light going out on my minimap. But he had done his job. The incoming force was a small group of lightning tanks backed by a much larger force of long-range rocket launchers and they were two minutes out. My base was reasonably well guarded by laser towers and I had a small force of Lancet Tanks I had bought from Tahh Mahtahh as well as a few Heavy Tanks armed with powerful Beam Cannons. If I could get lucky and punch through the front line of lightning tanks, they would make short work of the rocket launchers before the rockets could destroy my base. Initially my tanks were out of position, so by the time they could be brought to bear, the lightning tanks were already within range of the laser towers' beams. With the tanks nearly in position, things were looking hopeful until the alarm sounded and the voice came over the command channel "fuel-air missile launch detected." Uh-oh. Despite the pounding I knew they would take, I moved my tanks in closer to the lightning tanks hoping the plan wasn't to sacrifice them as the rocket launchers came into range. The flash came moments later. Brilliant white. The world shook and the battlefield was wreathed in smoke while my base burned. But fortune smiled upon me. My generators and laser towers were undamaged. With my defenses intact my tanks made quick work of the tip of the spear. When the smoke cleared I went looking for the rocket launchers, but they had snuck off back into the dark. That was awesome! Totally why I made The Imperial Realm::Miranda.